When Dr. James D. Hardy and his surgical team became the first to successfully transplant a lung from one human to another, there were no social media available to tout the landmark event. Nobody “liked” it on Facebook. Nobody twittered any congratulatory messages. No 24-hour cable news network or national daily newspaper existed to document the achievement, either. What Hardy and his team accomplished on June 11, 1963 has become somewhat overshadowed in history by what also occurred in Jackson on that fateful day – the murder of Civil Rights activist Medgar Evers – and by what Hardy himself accomplished just seven months later – the first successful transplant of a chimpanzee heart into a human. Indeed, in Hardy’s 452-page autobiography, The Academic Surgeon, the first successful lung transplant appears on only six pages. But the shockwaves of what Hardy achieved can still be felt exactly 50 years later. A native of Birmingham, Ala., Hardy earned his M.D. at the University of Pennsylvania in Philadelphia and did postgraduate training in general surgery and thoracic surgery at the Hospital of the University of Pennsylvania. A veteran of the U.S. Army, he was an up-and-coming director of surgical research at the University of Tennessee at Memphis when Dr. David Pankratz, dean of the School of Medicine at the still-under-construction University of Mississippi Medical Center, recruited him to become chairman of surgery in 1953. Bringing research grants and staff with him from Memphis, Hardy set up labs at UMMC in no time. Within a year, he began to concentrate on what would become the next leap in surgical evolution: organ transplantation. He started by perfecting the procedure in animals. With each successful surgery, Hardy slowly began to unravel the intricacies of transplantation. Over the years, he became convinced that human-to-human organ transplants were not only possible, but entirely ethical. Skeptics abounded. At a time when the atrocities of Nazi Schutzstaffel surgeon Josef Mengele’s medical experiments on prisoners at the Auschwitz concentration camp had come to light, the idea of experimental transplants in humans seemed downright Frankensteinian to some. By the early 1960s, the ethical structure of medical science still had not caught up to its seemingly limitless potential, according to Didlake. “IRBs (institutional review boards) as we know them today didn’t exist,” he said. “Many of the fundamental documents that govern human subjects research had not been written. Mixed in with that were the breathtaking advances that were going on in cardiovascular surgery, dialysis therapy. Hardy was preparing to offer one solution, at least. In the spring of 1963, all he needed was the right patient. On April 15, 1963, 58-year-old John Russell, a prisoner at the Mississippi State Penitentiary at Parchman, was admitted to University Hospital with a history of repeated bouts of pneumonia that antibiotics had failed to improve. Squamous cell carcinoma in his left lung had rendered it all but useless, and his right lung had been weakened by advanced emphysema. He also suffered from kidney disease. 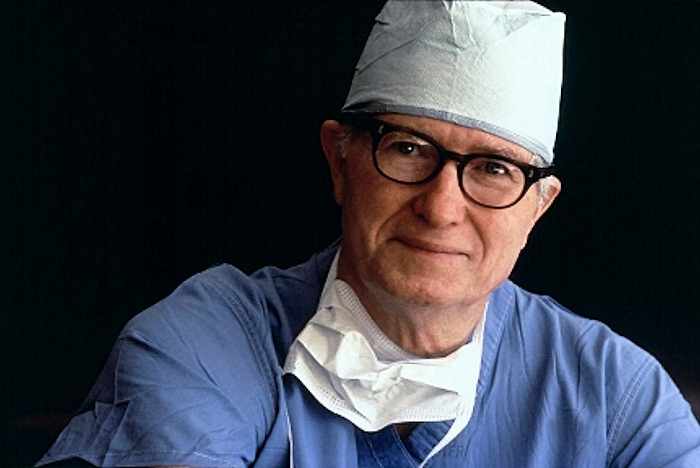 Dr. Robert Marston, then-dean of the School of Medicine, had granted Hardy permission to do a human lung transplant under certain agreed-upon conditions. So after further lab tests, Hardy’s team offered Russell the option of a transplant of his diseased left lung. Russell accepted, and on June 11, when a donor left lung became available, the transplant took place. Both the surgical team in charge of harvesting the donor lung and the team responsible for removing Russell’s left lung accomplished their tasks swiftly and ably. But Hardy encountered one potentially significant obstacle: The donor lung appeared too large to fit into Russell’s chest cavity. With some effort, Hardy managed to squeeze the new organ in place, and it began to function immediately. History had been made at the University of Mississippi Medical Center. But it wasn’t the only event of national significance taking place at that same time. With approximately one hour left in the operation, the surgical teams received an urgent call from the emergency room. His hands obviously full, Hardy asked Dr. Martin Dalton, a senior thoracic surgery resident on the donor lung team, to report to the ER. When Dalton arrived, he found an African-American man who had suffered a gunshot wound at close range. Dalton attempted to stop the man’s bleeding and used manual heart massage and defibrillation to revive him. Unfortunately, Dalton’s attempts were unsuccessful. He pronounced the time of death and made his way to the waiting room to notify the man’s family. It was then that Dalton learned the man he had been trying to save was Medgar Evers. As the 50th anniversary of Hardy’s pioneering lung transplant approached, Connie Machado, associate professor of academic information services, discovered many of the surviving 16 mm films of Hardy’s procedures, which the Rowland Medical Library had acquired in 2003, were in various states of deterioration. The one of immediate concern, naturally, was canister No. 97, marked “Transplantation of Organs (Heart Out).” Last fall, Machado obtained a National Film Preservation Foundation grant to restore the 10-minute film at a cost of $5,200. “We wouldn’t be doing transplants today if people like Dr. Hardy hadn’t had the courage to perform these procedures,” said Machado. “In the 1960s, health care wasn’t where it is now. They were trying to make a difference to improve people’s lives. Machado recently submitted three more of Hardy’s films for careful restoration. Although she won’t know exactly what medical treasures might be revealed on those films until they are returned, labels on two of them seem to indicate they could include additional footage of the lung transplant. The restored film in canister No. 97 opens with a demonstration of three different methods of performing kidney transplants. The coveted footage of Hardy’s initial lung transplant follows – in vivid color. The diseased lung is shown being removed from Russell’s chest cavity. Then, the new lung is shown being put into place. Finally, the procedure footage concludes with the wound being sewn up. At the end of the sequence, Russell appears post-op, propped up in bed, looking off camera. He manages a brief smile before the film abruptly comes to an end. It’s a sight McMullan remembers well – in real life. “The recovery room was serving as an ICU, and I would walk past the patient,” said McMullan, a surgical technician at the time. “I saw him smile from time to time. He had a tracheotomy. He was allowed to sit up at about a 45-degree angle in bed. It was his kidney disease – not the newly transplanted lung – that led to Russell’s death just 19 days after the transplant. But Hardy had proved to the world that lung transplantation could provide effective therapy for otherwise fatal pulmonary insufficiency. As significant as Hardy’s contribution was to medical science, the lung transplant was equally important to medical ethics, according to Didlake. “This transplant was part of a larger picture, part of the surging advance of medical technology. It was certainly part of a bigger evolution that pushed medical science forward,” he said. “At the time, Dr. Hardy was asking the right questions about the morality of these transplants. Throughout the last 50 years, medical science has benefited from additional perspectives to human biological research by philosophers, theologians and bioethicists. Now, more structured ways to approach experimental therapies have been developed and ethically more rigorous methods to test new treatments have been put in place. Hardy and his team can take some of the credit for these ethical advances, according to Didlake. McMullan put it more succinctly. “No matter what operation or what sentinel event occurs, somebody has to be the first to do it,” he said.